12 | February | 2010 | Through the seasons before us..
Should we be hoping for a Hull relegation? I found this interesting article on When Saturday Comes. It highlights how Forest and Hull haven’t met in competitive action since 1977 – with Forest going on to get promoted from Division Two and the Tigers finishing in the bottom half of the league. There’s been a lot of water under the bridge since then of course, and both clubs’ fortunes seem to diverge from one another meaning as one ascends the other descends. Of course such things can’t really be intrinsically linked – but it’s an interesting bit of trivia nonetheless. I’ve never really been one for trying to get to the magical 92 league grounds – not least because obviously there’s a degree of flux in which grounds are in that collective – but I do try to tick off grounds, and am now in the seventies. Hull City is one I’ve never visited, and it’s likely that the staunchest City fans of my age range won’t have visited the City Ground either. Because we haven’t met in a competitive fixture since March 1977. When I plan for away trips, if I need to compromise due to budgeting or time-taken, I usually go for grounds I’ve yet to visit (and invariably succumb to the temptation to revisit past haunts too). I found a website the other day that lets you track your grounds – and I had pondered Hull. Surely given both clubs mixed fortunes hopping up and down the leagues we must have encountered one another at some point? Could it be one of those Fulham-type teams where there was a limited period of crossover? No, we haven’t met at all for many a year. Our negative fortunes as much as the positive fortunes of the Tigers has given both sets of fans a great opportunity to tour grounds now hosting fixtures across all four of the football league’s divisions, yet not one another. And with Hull City currently hovering just above the relegation zone in the Premier League just as we find ourselves lurking just below the automatic promotion places – could it be that we could actually get promoted and Hull could avoid relegation to secure the opportunity for a long overdue reunion? Of course, survival for Hull – and indeed promotion for us – means rather more than the opportunity to play a particular team. But it’s an interesting thought for the day with which to welcome the weekend nonetheless. 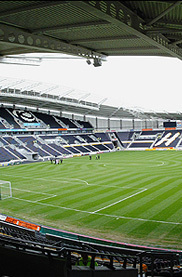 I’m trying to cut out the superstitious nonsense that us football fans seem to be so susceptible to, so I don’t wish any ill-will upon the Tigers and hope for the possibility of being able to tick off the KC Stadium on my list of grounds – and preferably in the top flight. So to conclude, I won’t be hoping for a Hull relegation!